Keeping you updated with where we are, what we're doing, and some behind the scenes moments with our crew. Warrane recently had the pleasure of overhauling the entire ground floor, front and backyard of the Tennyson Point House. Built roughly 40 years ago by a concreter, the layout and finishes deserved a modern spruce up. A beautiful balance was created between the owners request for a moody, semi-industrial vibe (much like Warrane's work on Moonshine Bar at Hotel Steyne in Manly) and the need for a more open, flowing floor plan which would allow for entertaining the owners large extended family. The homes exposed brick internal walls and archways were accentuated with portions being painted in a white render paint allowing for a clean, light backdrop to the home's new furnishings . The layout through the entire downstairs was altered for a new open plan kitchen and separate butler's pantry. The kitchen would now lead to the family's formal dining room, which also sectioned off to allow for a home office. 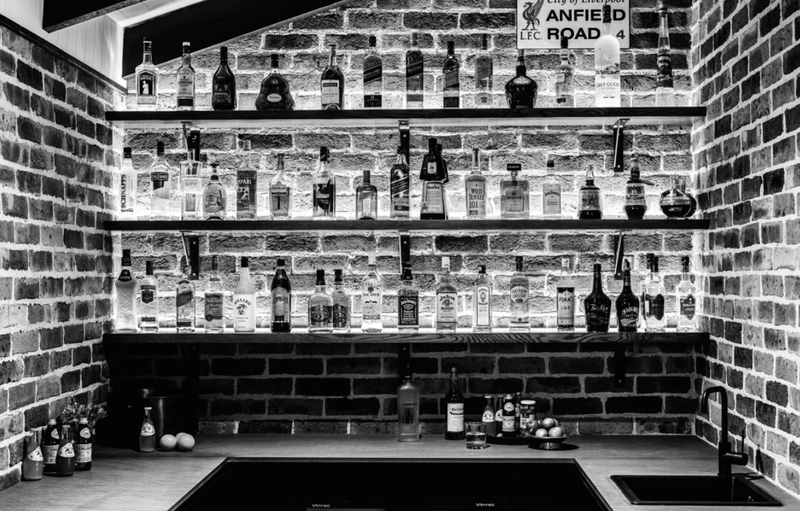 A 'man cave' was a top request and Warrane created a warm and inviting pub-like atmosphere with a home bar stocked with two Vintec wine fridges and 7 lineal meters of liquor bottle storage. The kitchen, now being the home's centre and heart, was fitted with appliances from Winning Appliances, including a luxurious Falcon freestanding cooker and tapware by Brodware. The project features custom joinery throughout, including 3 meter high hardwood barn doors to allow the option to segment the formal entry and lounge rooms from the kitchen space. The doors featured detailed iron work to finish the look. The loungeroom is now a welcoming family space with a Sculpt wood burning in-built fireplace and a custom leather lounge from Project 82. The room's new surround sound audio by Bose top off the experience. We're super chuffed that Moonshine Bar at Manly's Hotel Steyne got a mention in Qantas Travel Insider's article "Discover the Best of Manly - From Brunch to Bushwalks". It's always nice when our work gets noticed and enjoyed. ;) Read the entire article here! Located in the lovely ocean-side suburb of Bronte, this 90’s style corner-lot home was refreshed by Warrane into a beautifully functional dwelling for its family of five. A house with many reincarnations- the existing home was a hodge podge of 40's, 80's, 90's and early 2000's architectural styles. An entire rethink in the design was needed as the original layout was disjointed, dated and lacked functionality that was required by the occupants. Inspired by natural elements, the sleek, slimline and monochromatic elements in Warrane’s design fused together, bringing a modern warmth to the fit-out. Completed for their pre-Christmas deadline, the family now enjoy the visual play of textures of wood, hand-woven rattan, worn leather and marble that flow between their newly crafted kitchen, living room and bathroom. Warrane Pty Ltd is a “green foundation” building company that prides itself on honesty, integrity, intelligence and combined with a transparent ability to get the job done with the least amount of commotion. Our service is impeccable and provided with a “country smile”. Combined over the past 26 years we have developed trusting, good and long lasting relationships with our clients and value these relationships as we continue to grow. We are now proud to offer the new school additional team with a keen eye for service and detail with our minds on the environment. To date the majority of our works have been completed under the BlueSky Design and Construction banner and these works have more recently taken place in Sydney’s Eastern Suburbs and Northern Beaches including Mosman, Manly, Bondi and Bronte. Not limiting too, we have a rich history in regional NSW from Moruya & Shellharbour to Oberon and Internationally Fiji. Our clients are both Architects and families and we enjoy working with Architects in a collaborative Design / Build process. Our clients seem to recognise our attention to detail and are encouraged by our appreciation for design and its proper execution. We are a small company with family values and a long working history in Australia with experience in managing both Lump Sum and Cost Plus Contracts from 50K up to 2.8M in residential builds and up to 10M in commercial Hotel Fit-Outs and Heritage Refurbishments. We deliver projects on time, on budget with an attention to detail. Cruise Bar I That's a Wrap! Every job has its perks and different elements that make it unique or exciting. Doing the fit out for Cruise Bar Sydney was amazing, simply because of its location. Being able to look out over Sydney Harbour during your working day is a pretty rare treat. It took a total of 46 specialist tradesmen/ craftsmen and labourers over 37 days to complete the 3 level fit out. It was great to bring so many skills and diverse working backgrounds together to complete the job. From the design by Sydney design team Design Native, to the construction and fit out, it was a huge team effort with everyone from the labourers, to the management team playing an essential role. The brief was a hark back to a dockside feel combining industrial nautical aesthetic with an Asian infusion on the second floor. We achieved this through both the design and materials used. Being passionate about heritage materials, we used recycled timber wherever possible. We sourced beautiful oregon timber reclaimed from an industrial warehouse in south west Sydney as well as some incredible 100 year old heritage timber from the old Sydney Harbour wharves. It was good to be able to preserve that heritage and bring a sense of Sydney's history to the venue. We are really proud of the end result. Check it out if you haven't already. A perfect spot for an after-work drink whilst watching the sun go down over the Harbour. Clocking up almost a decades worth of onsite collaboration, Warrane Head Honchos Joe Stephen, Chris Sheehan and Nathan Hall have gone from workmates to great mates to business partners. With a collective ethos behind every job they undertake; Your Partner in the Built Environment, it’s this shared commitment to their clients that has taken them from strength to strength. What sets Warrane apart from other construction companies is their unique ability to fully service a project from the design process to project management, construction and consulting. There is a passion and a dedication to bringing the vision of each individual client to reality and the client’s satisfaction is the number one driving force behind each project. Alongside the commitment to their clients is a passion for the built environment itself. Wherever possible, materials are sought from sustainable sources and repurposed into something unique giving each project a sense of timelessness. Not simply part of the manufacturing industry, Warrane are a part of the service industry with an understanding of the needs of their clients in the hospitality and hotel industries predominately. Drawing on the diverse backgrounds of the team, Warrane bridge the gap between design and functionality, highlighting essential elements of the hospitality industry that are often lost between the aesthetic and structural design. Joe, Chris and Nathan met whilst working for a company called Bluesky Design & Construct where they collaborated on various projects. Over time, the opportunity came to take over the company which they renamed Warrane. The name Warrane was serendipitous, but a perfect fit. Warrane actually means ‘Blue Sky’ in the language of the Nganyaywana people (Armidale region) and was the name of Joe’s family farm. The farm was sold around the same time as Joe, Chris and Nathan took over the business and so the name Warrane seemed like a good legacy to carry forward. Along with the name comes the philosophy Warrane represents; a connection to land, a reverence for indigenous history and culture and a reminder to always appreciate that big blue sky. Joe and Pete look on as Michael Jones is photographed, with Blake and Tom sorting out the background props. Today we had the full Warrane team onsite with everyone going hammer and tongs putting the finishing touches on Cruise Bar at the OPT in The Rocks - an awesome project we've been working on, with a seriously short turn around time. Needless to say the boys got it done, even considering a few of them had to step in as models for a photo shoot with venue manager Michael Jones! You can read the full article on the venue's renovations here. Stay tuned to CruiseBar.com.au for more details.